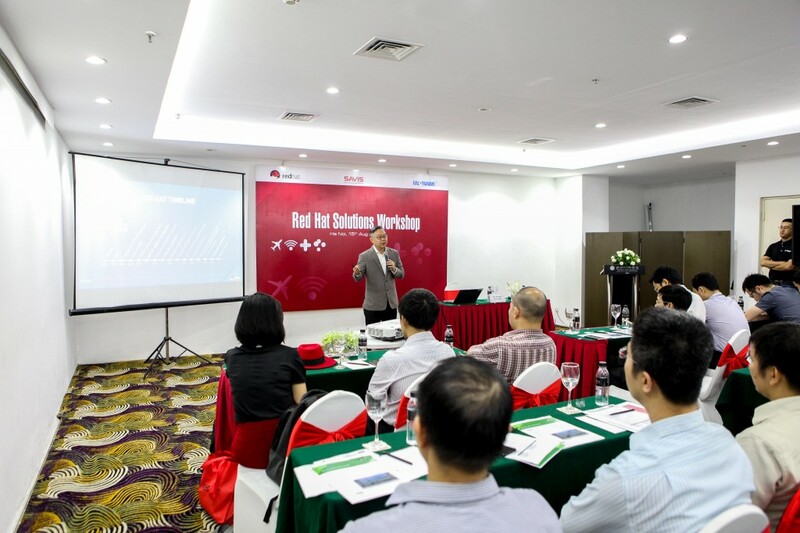 On August 15th, 2017, at Pullman Hanoi, SAVIS Vietnam Corporation cooperated with Red Hat and Ingram to hold the seminar named “Red Hat Solutions”. The participation is more than 50 guests from many companies and banks. The main content of the seminar revolved around the topic of digitization towards the future and the solutions and operating system that Red Hat offers. At the beginning of the workshop, Mr. Hoang Nguyen Van, CEO of SAVIS Vietnam Corporation, shared his views on Red Hat and the collaboration between the two companies. He said that SAVIS appreciated Red Hat’s approach to the Vietnamese market and its prospects for co-development. Soon afterwards, the guests listened to presentations by foreign experts from Red Hat. Mr. Yaw Hu Law, Red Hat Regional Director – ASEAN Growth Economies, addressed the urgency of digital transformation and why businesses or organizations should go with Red Hat. Then, Mr. Nicky Phun – Territor Sales Manager and Mr. Gan Cheng Kuan – Senior Solution Architect for ASEAN also shared their views on two topics: “Optimize existing I.T to increase efficiencies and innovate faster” and “Digital Transformation – A Journey towards Future State”. The atmosphere of the workshop was extremely active, especially in the last Q&A session; The banking sector was the industry that shows the highest interest. Red Hat, Inc. is an American multinational software company providing open-source software products to the enterprise community. Founded in 1993, RedHat has its corporate headquarters in Raleigh, North Carolina, with satellite offices worldwide. Red Hat has become associated to a large extent with its enterprise operating system Red Hat Enterprise Linux and with the acquisition of open-source enterprise middleware vendor JBoss. As of March 2016, Red Hat is the second largest corporate contributor to the Linux kernel version 4.5 after Intel. SAVIS Vietnam Corporation now becomes Red Hat’s ISV Partner (Independent Software Vendor). Accordingly, SAVIS will be the unit to coordinate distribution, development of Red Hat products in Vietnam market. With more than 12 years of experience in the field of IT, SAVIS is confident that the collaboration with Red Hat will bring the best solutions to customers from a variety of industries.